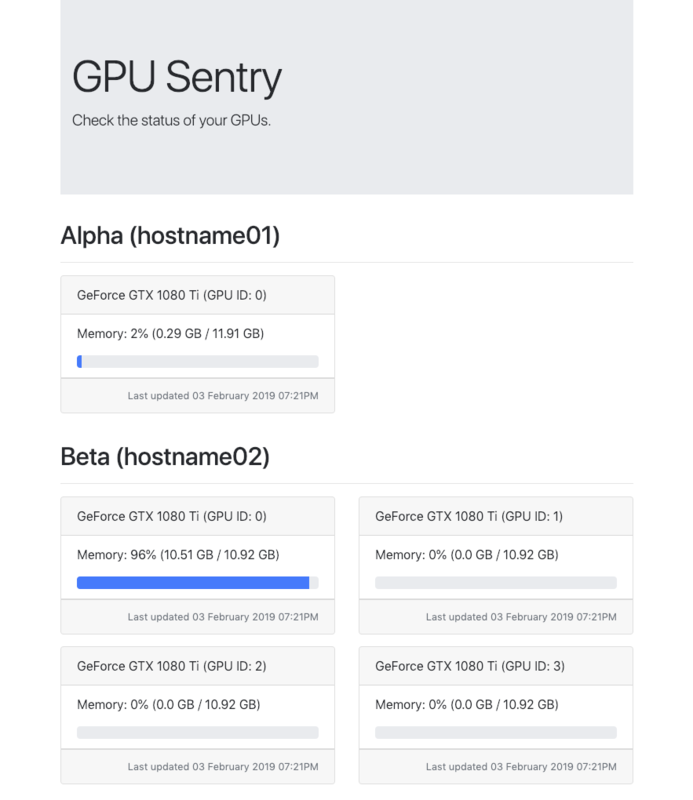 Instead of checking each of your machines with nvidia-smi command, a client running on the machines is sending periodically statistics about GPU memory utilisation. The central server is collecting the requests and displays them on a single website. Run pip install -e . to install all the dependencies and the package itself. Most of the settings can be found in config.py. CLIENT_TIMEOUT allows to set how often a client, i.e. the GPU machine sends statistics to the central server. You can alter the value with the amount of seconds you wish to set. PERMIT_CLIENTS has two fold purpose, first the keys are used to filter out machines which will be displayed on the website, i.e. we permit only machines with the specified hostnames, and the corresponding values point to display names. Currently the package does not work as a background process so please use screen, tmux or wsgi.